I've been doing this free from food thing now for a long time, like 30+ years long. For those of you who are new to my blog, I'm allergic to milk and eggs and I choose not to eat meat. I'm super excited for all the new vegan products that have hit the supermarkets in recent months especially pizza. I've been making my own pizzas for years but it's such a dream to be able to grab something ready made. I thought it might be nice to show you what is available starting with my favourites. Waitrose Vegan stonebaked & hand stretched mushroom & kale pizza (chilled) - this is top of my favourite list, the base is authentic and tasty, it's loaded with toppings and sauce which makes up for the small amount of cheese. I like mushrooms and kale so it works for me. Wicked Kitchen Caponata Pizza (Tesco, Chilled) - Seeded sourdough base topped with caper and basil tomato sauce, caramelised shredded red onion, marinated aubergine, red peppers, olives and red onions with a sachet of mint herb salsa. I've a fan of this one, even though it doesn't have cheese the toppings make up for it, this also have a thicker base. Whole Creations Dairy & Gluten Free Roasted Tomato & Basil Sheesy Pizza (Sainsbury's, Frozen) - Thin & Crispy Stonebaked Pizza Topped with Slow Roasted Cherry Tomatoes, Dairy Free Sheese & Drizzled with a Basil Dressing. This is a favourite as it's super cheezy, the gluten free base is decent and I love the flavours. There is also a Butternut Squash, Red Pepper & Caramelised Onion Sheesy Pizza which is currently in my freezer waiting to get the taste test. Oumph! Italian Style Pizza (Tesco, Frozen) - Stone-baked pizza base topped with tomato sauce, strips of soya protein, semi-dried tomatoes and rocket, dusted with seasoned breadcrumbs. I enjoyed the flavours, the base is decent and the Oumph strips added a "meaty" texture but the disappointment for me is a "may contain milk" label. Goodfella's Vegan Falafel Pizza (Tesco, Sainsbury's, Asda, Frozen) - Stonebaked Thin Pizza Base Topped with Falafel, Spicy Tomato Sauce, Red Peppers, Onions, Spinach and a Houmous Drizzle. At first the thought of falafel seems a little odd but it actually works very well. If I'm not mistaken this is the cheapest ready made pizza at £2.50. It doesn't have vegan cheese but it has a good amount of topping and tomato sauce. Kirsty's Free From Margherita Pizza (Tesco, Frozen) - if you love a super cheesy pizza this one is for you, it also has gluten free base. This is a good one for those who enjoys simple flavours or wants to tailor to their own taste buds as you can easily add toppings. Pizza Express Classic Vegan Giardiniera (Waitrose, Chilled) - a classic base topped with spinach, red onion, artichokes, garlic roasted mushrooms, vegan mozzarella and passata. I have to say this one is okay but they really scrimp on the cheese, I personally would rather eat this one in their restaurants as the quality is better. 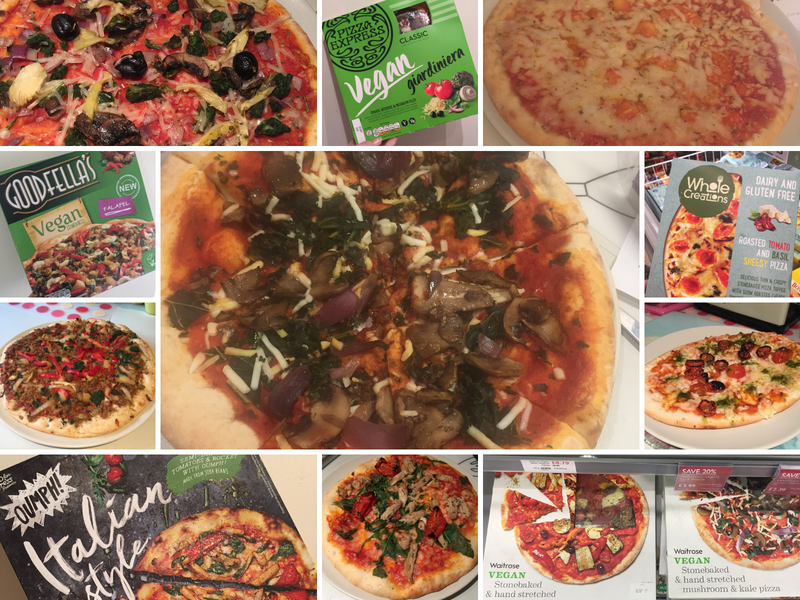 The White Rabbit Pizza Co. Smokin' Vegan (Sainsbury's, Waitrose, chilled) - I believe this was the first Vegan pizza to launch and personally everything that has followed is superior, I really dislike the lack of toppings and the gluten free base. Do you have a favourite Vegan pizza? Let me know which one.